Based in County Durham, the manufacturers of the Agrippa fire door holder and closer launched the wire-free range at the International Trade Show, Firex. Three years on, sales of the Agrippa devices have gone from strength to strength. Here we look at what makes them stand out from the rest. Until now, the reliability of wire-free fire door holding and closing devices has been questioned by fire safety professionals due to false activations and damage caused to soft furnishings and the fire door itself. It was in response to these concerns that innovators of fire safety products, Geofire developed its unique ‘listen and learn’ technology. This advanced pre-programing means that the devices pre-record the sound of the building’s specific fire alarm and only release the fire door should they hear this particular sound. Geofire’s Agrippa range of wire-free fire door holders and closers have been very popular in environments where minimal disruption is desired such as care homes, schools and hotels. 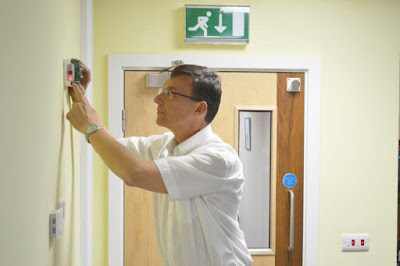 The cleverly designed battery-powered units mean that there is no need to re-wire a building’s current fire door activation system. The devices can be fitted in a matter of minutes and are even complete with a handy, step-by-step installation video. Both products are hygienically installed at the top of the door, ensuring there is no damage to floors/carpets or any warping of the fire door. It is often beneficial in such environments to hold open fire doors to ease access and increase ventilation during busy periods, where as many building facilities managers fall into the trap of wedging open fire doors without realising they could be prosecuted for doing so. The Agrippa fire door holder is a simple solution to holding open internal fire doors. It is competitively priced and easy to install. The holder is particularly useful for holding open fire doors in corridors and there are many accessories available including chain keepers and extension brackets for non-standard installations. The Agrippa fire door closer is a swing-free device which allows the fire door to be held open in any position. It will make the door resistance-free and so it will feel light and easy to move. The closer has been installed into care homes in the UK to reduce isolation for residents in their rooms. Last but by no means least, the devices comes supplied with two C-cell batteries, can be programmed for daily release, have a battery life indicator and both products are approved to EN1155 and CE marked. The illustrations show how the Agrippa fire door holder can be installed in five easy steps. Designed with the installer in mind, the holder can be fitted in less than ten minutes. For more information go to www.geofire.co.uk , call 01388 770 360 or email enquiries@geofire.co.uk.